Screenworks member Brendan Shoebridge gives an overview of his recent involvement in the anti coal seam gas mining protest at Bentley. As you probably know, after years of living under the cloud of unconventional gas mining and the threat of gas field industrialisation it appears the Northern Rivers have won a decisive battle. Preparations for the Bentley blockade began in earnest last spring as protectors saw the need to wake up Lismore and the Northern Rivers community to what was coming. Bentley is the 5th blockade to have occurred in this region against the speculative mining company Metgasco. Lots of roadside flash mobs and PR stunts were planned and sent to local media outlets. Things quickly escalated in the New Year when drilling plans were confirmed by Metgasco and the pressure was on to get things moving. David Lowe and myself fell into managing media needs and the lovely Jennie Dell, a local ex-journalist, became our media liaison person. An onsite media van was donated with solar power and edit space – but with little or no funding available to us it required some good strategic thinking from the team and a big social media push. It was clear that this was simply a numbers game and we needed to generate some hype and urgency fast or Metgasco would get their vehicles and man camp onto the site and thus be a big step closer to their plan for a thousand plus gas wells north of Lismore. The ‘Will YOU show up?’ campaign was born one misty morning at the proposed drill site after Ruth Rosenheck and myself spent a brief moment swapping ideas and realised we shared a very simple vision. It immediately seemed to have legs and after a series of short rushed promos, we had an idea that was gaining traction very quickly. So with mainstream media avoiding the issue and Metgasco spinning its web over the airwaves a call went out and some wonderfully talented people did show up to help the cause. One memorable turning point for me came after a media strategy meeting with the wonderful Cate McQuillan and Hewey Eustace – their creative energy lifted our spirits immensely and suddenly anything was possible. And then, at about that time it all started to flow our way – together we filmed each and every event including almost all the ‘Greet the Dawn’ ceremonies. High profile musicians such as John Butler, OKA, Xavier Rudd, Pete Murray and Ash Grunwald were organised for pop up concerts, EPKs were sent across the entire country and before we knew it, we had over 3000 people turning up one rainy morning to an orange alert and national media crying out for footage. The camp swelled overnight as we excitedly counted over a thousand cars on the site and thanks to more great vision from a dear friend and colleague we had, for the first time, the technology to capture the size of the crowds and the scale of the campsite via a drone and a go pro. The impact of this bit of kit is hard to quantify but it was huge. The camp had become a thriving self-organising community and there was no going back from this point. The story seemed to get bigger every day as creative ideas flowed and more people got active. A highly successful ‘Rock the Gate’ fundraiser was held at the Brewery in Byron which netted enough funds to create a modest TV campaign. Then after pulling together a 60 sec and 30 sec TVC plus radio spots a $30,000 donation was made by an anonymous supporter to buy more airtime and saturate local media. All national media outlets (including OB vans and 4 helicopters) were now booked in to cover the 900 plus police force descending on the site. Our bestes online casino suggested they’d arrive Sunday and start enforcing ‘mining by martial law’ on the Monday or Tuesday and continuing over the next 30 days at a cost of $14 million to the Australian taxpayer. Channel 7s Adam Walters did a great news series on the campaign and exposed Thomas George and his conflicts of interest. On the Wednesday Alan Jones delivered a magic dressing down of the NSW Government and Metgasco. Our 60 sec TVC went out the same evening (see clip above) via a co-ordinated thunderclap social media push and aired seven times in prime time on the first evening. Then, all of a sudden and from out of the blue the next morning (last thursday) we received a phone call from a Sydney contingent of farmers visiting the Premier sending word that the NSW Mining and Resources Minister had suspended Metgasco’s licence! The message was relayed to the group gathered at Gate A at about 5.30 am by the wonderful Nan Nicholson, an original Terania Creek protector, and instantly the celebrations erupted. I couldn’t stop comparing it to the Ewok party at the end of Return of the Jedi. The news is still sinking in for many, including myself, but it appears that Metgasco and all others seeking to industrialise our beloved region are now mortally wounded thanks to the power of a united community. 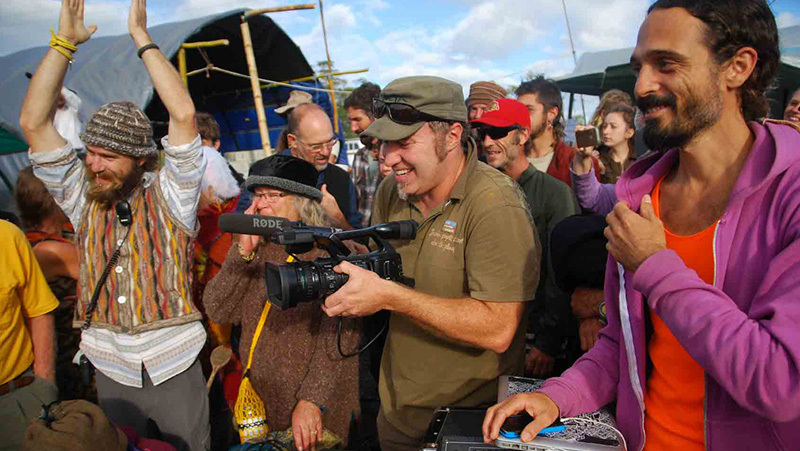 For David and myself, our work is only really just beginning as we now embark on telling the story of the battle for the Northern Rivers and seek funding for a feature length doco and other tools that we hope will inspire change and courage in many other communities facing these challenges, both here and around the world. This story seemed to contain everything and we feel deeply honoured to be able to share this struggle with a much wider audience. We will obviously require financial support and welcome any support available. We are already seeing many people now lamenting the fact that they didn’t get to experience Bentley. Nan seemed to nail it when she said: “The only blockades I regret are the ones I didn’t go to”. But, with more than half of our continent under some form of unconventional gas mining licence, the war to win back our country is far from over so I encourage all media bods to get onboard as we attempt to wake up the sleepy masses before the industry advances further and its too late to act. There are so many issues to cover so I urge everyone to take a lead where they can. Looking back we really didn’t have the manpower to do the job as well as it could’ve been done but Im sure there will be other opportunities. Did you know that the drill rig we were supposed to get was rebooked and redirected to the Northern Territory? There is a drilling operation now planned just 75 kms from Uluru! Nothing is sacred. But here, at least for the time being, the clouds have parted. As Aidan Ricketts said on the day, we’ll never know which drop in the bucket tipped the balance but they all added up. My biggest thanks goes to the tireless David Lowe for his super human efforts. Amazing stamina and passion. Boudica Cerese, Jennie Dell, Adam Guise, Aidan Ricketts, Ian Gaillard, Ruth Rosenheck, David Warth, Ondy Cleland, Noli Lee, Mylene Routin, Duncan Wilson, Paul Robert Burton, Susie Foster, Jenny Grinlington, Cate McQuillen, Hewey Ustace, Kris Gardner, Andrya Hart, Jimmy Malecki, Paris Naday, Darmin Cameron, Rod Poole, Rani Brown, Tony Lake, Rohan Langford, Ron Way, Rani Brown, Salvadore Castro, Grayson Cooke, Chris Liddell, Steve Nossiter, Amanda Shoebridge, Aliison Kelly, Guy Sohm, Martin Jacka, Rihab, Adam Biggs and John & Scott from Sharkboy Productions. And thanks to the many others that contributed, esp in the media realm (A thousand apologies if I have neglected to mention you!). Yep, crazy but exciting times.